Fred Elias was a legendary musician. An Arab violinist, living to an impressive age of 95 years old, passed away only a few hours ago from the publishing of this blog. 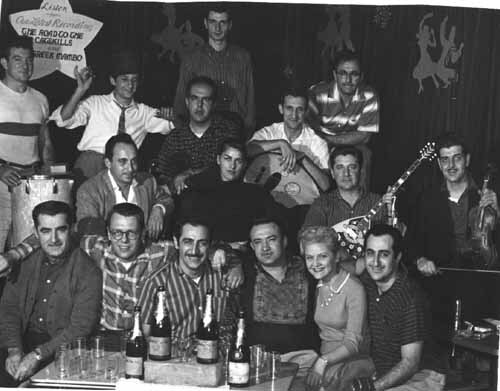 Fred is in the middle row on the right, next to the bouzouki player. He was well regarded throughout the country, especially in the east coast. Many would call him a “helluva violin player!” He played up until near the end of his life. A staple in Middle Eastern music, Fred played with all ethnicities (Armenian, Arab, Greek, Turkish, etc) and knew more about the modes (scales) and the music than most musicians. He was trained at the Boston Conservatory of Music and was a true virtuoso that performed with countless musicians such as Eddie Kochak, Joe Kouyoumjian, Emin Gunduz, Korkoras Brothers, and Buddy Sarkissian. He recorded 78RPM records, LPs and CDs. He was an active musician with a great sense of humor. I had the pleasure of meeting and playing with Fred several years ago in Boston and he couldn’t have been any nicer to me. For us as musicians, Fred was an icon. He was one of the masters. Loved and admired by so many musicians and patrons. He knew the Rat Pack (Sinatra, Davis, Martin) and travelled with comedian/actor Danny Thomas at one point playing gigs. God bless Fred for all the music and enjoyment he brought to us all of these years. Enjoy these YouTube clips containing some nice music from Fred. This entry was posted in music, Uncategorized and tagged arab, Armenian, Fred Elias, Middle Eastern, music arabic, violin. Bookmark the permalink. Thank you so much for posting this – especially the videos of Fred Elias as he played. What a magnificent virtuoso! It is wonderful to be able to hear his artistry. It saddens me to hear that another popular USA ethnic musician who made so many happy has passed away. My husband Nick Dakis (Pourpourakis) who played bouzouki told many years ago about the people he worked with throughout his career and Freddie was one of those many fine performers. The awesome Kokoras Brothers sent us some of the music and it was a thrill to listen to this talented man. May he rest in peace. Freddie brought our heart into our dance, every time he played for us. He was a mentor, an inspiration, and a great treasure. He will always be in out hearts. Freddie was a kind and generous man, a brilliant musician and wonderful human being. I wrote his life story for Guilded Serpent and it was fun talking to him in those interviews. He will be dearly missed by so many. Fouad “Freddy” Elias will be so missed! His violin solos just kept getting more soulful over the years! My late husband Ibrahim Maalouf and I worked with Freddy and he was a musician’s musician, a dancer’s musician…..he was everyone’s musician! He will be forever in our hearts! I was surely blessed to have been able to dance at many venues while Freddy played his violin. What fun it was. This talented, sincere gentleman will always be in my heart!! Thanking Freddy and Rony Elias for their leading me (and George) to this scene right in Freddy’s kitchen in Manchester. Hello to Za-Beth and PHAEDRA-do you remember when I had you here in Estero Florida many years ago?